How Can I Remove Posts & Profiles From my App? Remove unwanted or offensive content, or delete an attendee profile to revoke their access. Sometimes you may need to remove inappropriate or unwanted content posted by a user. While it's not possible to moderate what's being posted to the Activity Stream beforehand, you can delete any comment after it's been posted. You can also delete a profile to remove a user from the list of profiles. Deleting a user's profile will automatically hide all of their posts. If you'd like to delete the profile, go to the "Social" > "Profiles" section of your management dashboard. Click on the 3-dots icon next to the profile you'd like to delete and click "Delete". Please note, that any content associated with this profile will be permanently deleted, this attendee will not be able to register again with this email address. This action is permanent, it cannot be undone, and the profile cannot be reinstated. An unclaimed profile cannot be completely deleted, though it can be revoked. This works almost the same way as deleting a profile, but it can be reinstated later on if needed. 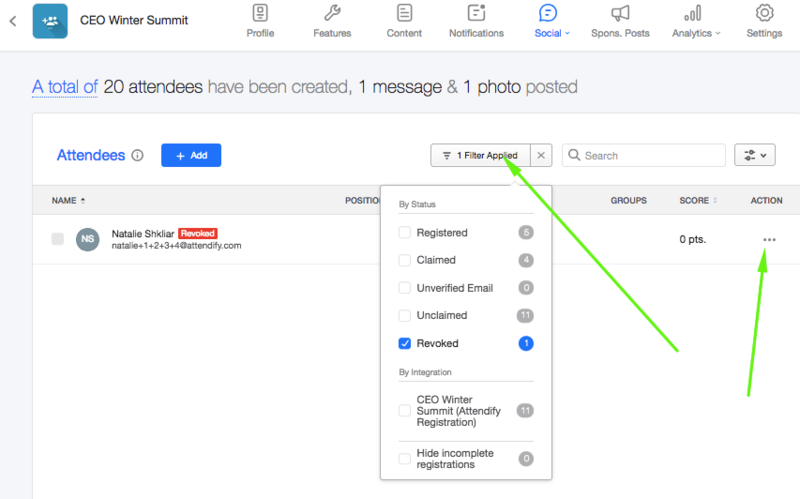 To reinstate a revoked profile, filter your attendee list to show the revoked profiles, click the 3-dots icon next to a profile, and select 'reinstate'. In a Multi-event app the profiles can be permanently deleted at the Container level of the app, in the People section.